LAMINGTON HOUSE offers a small but very selective breeding program emphasizing structure, substance and soundness to the discriminative enthusiast. The LAMINGTON HOUSE Rhodesian Ridgeback is large-boned and with substantive musculature, usually red wheaten with black masks or highlights. LAMINGTON HOUSE Ridgebacks are bred for structural soundness, good temperament, and versatility: conformation, obedience, lure coursing, and agility. LAMINGTON HOUSE Ridgebacks or their progeny can be found in numerous states, Canada and Japan. All puppies, and the occasional older dog, are sold under written contract with lifetime guarantees against dysplasia (unless abused, neglected or trauma caused). 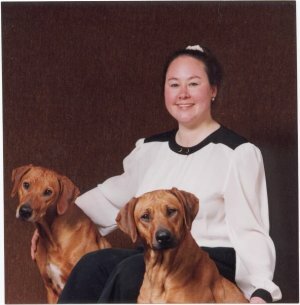 Linda Hothan is a member of the Rhodesian Ridgeback Club of the United States (www.rrcus.org), the New England Rhodesian Ridgeback Club (www.nerrc.org), the Windham County Kennel Club, and the South Windsor Kennel Club. Lamington is a Registered kennel with the American Kennel Club. Tulinagwe of Lamington earned her ASFA Field Championship in October 2001. "Tuli" began her Lure Coursing career at an advanced age, and now, at 8½ years old, she may be the oldest dog in history to attain this coveted titleTuli is owned by Sue Rexford. Howell Book House, publishers, picked "Rosie" to be the 'cover girl' for The Rhodesian Ridgeback, which is part of the series "An Owner's Guide to a Happy Healthy Pet", written by Eileen Bailey in 2000. Many LAMINGTON HOUSE Ridgebacks are pictured throughout the book. Lamington's Gone With the Wind earned her conformation Championship in 2001. "Scarlett" is co-owned by David Brown. "Pilot's" grandson, Canadian Ch. Priderock's Hakuna Matata ("Desmond"), on being #1 conformation Ridgeback in Canada in 2001. Lamington's Odysseus, NA, NAJ, earned the Novice Agility and Novice Agility Jumper titles in 2002. "Ody" is owned, trained and handled by Cynthia LaPorte.